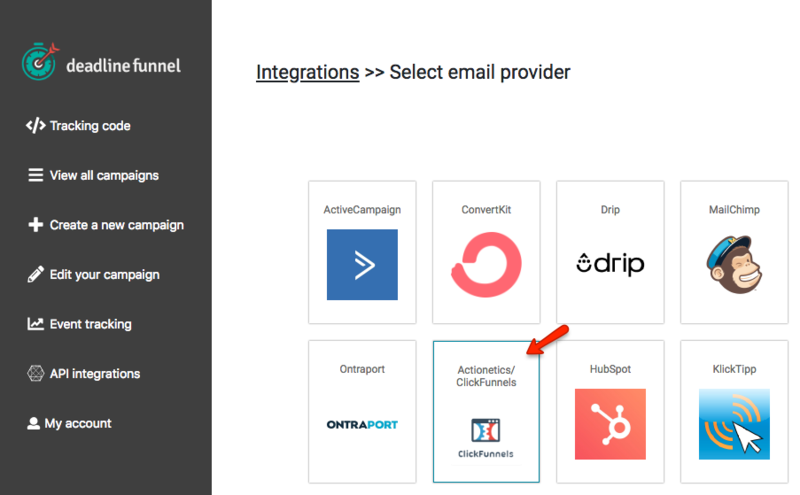 This article explains how to connect Actionetics or ClickFunnels with Deadline Funnel via an API integration so that when a lead submits a ClickFunnels optin form their Deadline Funnel tracking will begin. You can also trigger tracking when someone makes a purchase. Important: You need to complete the setup of your first evergreen campaign before you will see the API integrations link in the left navigation. 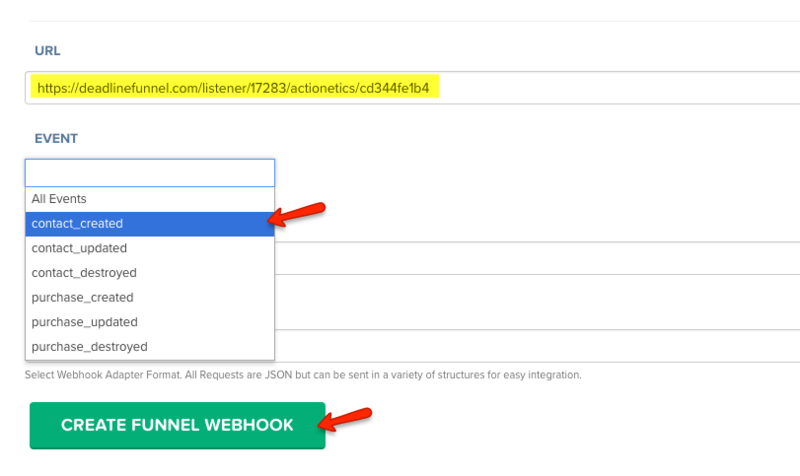 Create an Evergreen campaign with an API/Webhook trigger to follow along with this tutorial. When would I use this integration? This integration enables you to sync Deadline Funnel and ClickFunnels via API if you’re using an email service provider that Deadline Funnel doesn't offer an API integration with. If you're using an email provider we do integrate with via API directly, it's best to use the API integration for that email service. When someone submits the ClickFunnels optin form, the information will be sent to Deadline Funnel and Deadline Funnel will start tracking their deadline. Note: You will select 'purchase_created' as the event if you want to trigger your countdown upon purchase. Be sure to opt in through your ClickFunels optin form and click on the links in the emails and verify that the tracking is working correctly. It's important to test your funnel before sending live traffic. As of the most recent update to this article, Actionetics does not offer custom fields. This means that you have all the functionality of some of our other email software integrations... except for the ability to mail-merge the lead's actual "deadline text" into your Actionetics emails. For more information on this feature, click here.